How plastic fencing drastically reduces the time and money spent on maintaining wooden fence panels, lasts much longer and is more environmentally friendly. If you’ve had enough of repainting the fence with what seems like monotonous regularity, or replacing the odd panel that’s rotted away or become damaged, then a more permanent and maintenance-free alternative might appeal. Top quality plastic fencing could be the answer to saving yourself trips to the DIY store to pick up yet another tin of wood paint, cleaning paint brushes and generally taking hours of your time that could be spent actually enjoying the garden. Indeed it could be part of a generally low maintenance garden. A key home improvement method has been the general replacement of natural or hard to maintain materials with low maintenance, durable alternatives such as plastic. Think of the difference UPVC has made to windows compared to wooden frames and the amounts of painting and repainting they cause. Gutters and drainpipes are commonly replaced by durable and low maintenance plastics, and artificial grass is certainly catching on as householders look to save time and expense in lawn maintenance. Fencing is heading in the same direction; traditional wooden fences are giving way in more cases to plastic garden fencing as techniques improve and householders look to save time and money. Plastic has been a popular choice in the USA and much of Europe for the last two decades and it’s catching on now in the UK. Why is plastic fencing so good? The two key benefits are longevity and low maintenance; plastic fencing will outlast wooden, and practically no attention is required apart from the occasional wipe or wash down. Compare this to wood where, sooner or later, some or all of it will require replacement and during its lifecycle time consuming maintenance, including painting or coating, will be required. Environment – trees are cut down to provide the wood for traditional fencing while plastic fences are made using recycled plastic. Long term value – over the longer term plastic will prove more cost effective than wood; the increased maintenance and associated cost of materials such as paint and its shorter lifespan will offset the higher initial price of plastic fencing. Damage resistance – plastic is far tougher and more durable than wooden fencing so will stand up more readily to knocks and dings over the years. Durability – plastic can stand up to the punishment meted out by the UK climate; it will resist water so won’t become waterlogged in high rainfall times and won’t swell or contract with temperature variations unlike wood. The colour won’t fade over time under direct sunlight; they’re made to be colour fast through UV treatment. Plastic fence panels can be easily fitted into the concrete posts in situ for wooden fence panels or new, galvanised steel posts can be installed; these are lighter and stronger than concrete. Basic fitting of plastic panels is within the scope of the DIY enthusiast or general handyman. 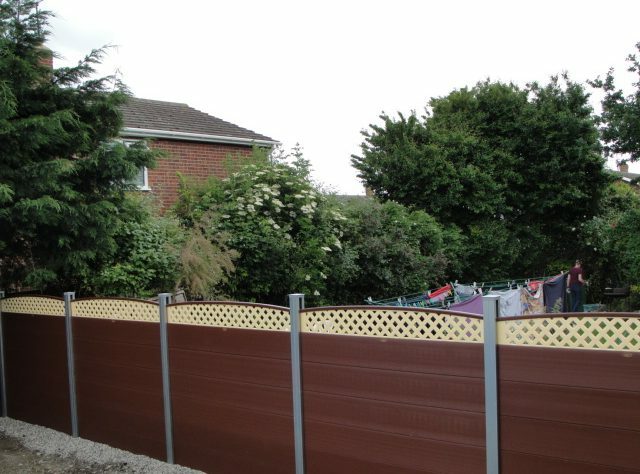 The panels can be specified in different colours and styles from a ‘standard’ solid look to other styles such as a trellis type, and some manufacturers will guarantee their fencing against rotting.